Receiving and award is fulfilling as it is always great to feel appreciated which in turn boosts morale. 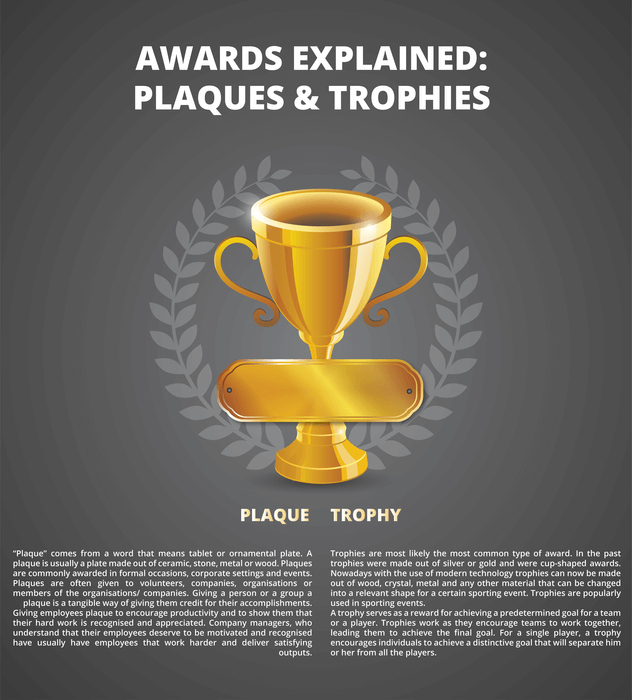 Trophies and plaques are the most common types of awards; this is because they are the most frequently used types of awards. Let’s go through each type to provide a better understanding on what Trophies and Plaques are. Trophies are most likely the most common type of award. In the past trophies were made out of silver or gold and were cup-shaped awards. Nowadays with the use of modern technology trophies can now be made out of wood, crystal, metal and any other material that can be changed into a relevant shape for a certain sporting event. Trophies are popularly used in sporting events. A trophy serves as a reward for achieving a predetermined goal for a team or a player. Trophies work as they encourage teams to work together, leading them to achieve the final goal. For a single player, a trophy encourages individuals to achieve a distinctive goal that will separate him or her from all the players. “Plaque” comes from a word that means tablet or ornamental plate. A plaque is usually a plate made out of ceramic, stone, metal or wood. Plaques are commonly awarded in formal occasions, corporate settings and events. Plaques are often given to volunteers, companies, organisations or members of the organisations/ companies. Giving a person or a group a plaque is a tangible way of giving them credit for their accomplishments. Giving employees plaque to encourage productivity and to show them that their hard work is recognised and appreciated. Company managers, who understand that their employees deserve to be motivated and recognised have usually have employees that work harder and deliver satisfying outputs. Unfortunately, a lot of organisations still do not see that an award is an investment. Awards help to keep staff members feel appreciated and which in turn encourages them to remain loyal. An award is the most inexpensive and most effective way of showing reinforcement. Many people take pride in their awards and place them on display in their homes for everyone to see, therefore make sure to choose plaques that are made out of the best quality materials.